How will the doctor diagnose my baby? A doctor will be able to test for baby ringworm by taking a careful look at his scalp or skin. They may also examine the irritated area beneath a Wood's lamp or gather a painless and minute scraping of your child's skin to be analyzed under a microscope. If you discover and unusual rash on your baby's body, consult your doctor straight away and get their opinion. When a child has ringworm, the most common thing to a doctor to suggest is an over-the-counter anti-fungal cream. This will need to be applied twice every day, ensuring that it's spread about an inch past where the end of the rash is. You will need to wait about 4 weeks to start seeing the rash fading, and you will also need to continue the use of the cream for a good week after the rash appears to be gone. It is worth bearing in mind that some children can be particularly sensitive to the ingredients within these creams, so you should use a tiny amount at first to find out if your baby's skin is going to react. If it does, consult your doctor and ask for an alternative. Our personal recommendation is the anti-fungal cream Phytozine which has been proven to eradicate ringworm on the scalp within 2 to 4 weeks. The scalp must be kept both clean and dry during treatment. Ensure that you have washed your hands thoroughly before applying any creams. Something stronger may be prescribed by the doctor if your baby has one of the more stubborn cases of ringworm and there are some cases where an oral medication will be required to treat the ringworm. If the ringworm is located on the scalp, it can be more difficult to treat and might take a lengthier time period to start clearing up. Your doctor will prescribe a medicated shampoo as well as an oral anti-fungal medicine. 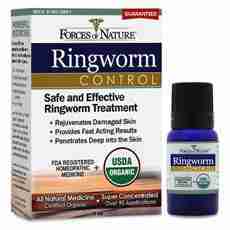 It'll take around seven weeks for the ringworm to start clearing up. Strict hygiene is essential when you are dealing with a baby that's got ringworm, so ensure that you have thoroughly washed your child's clothing and bedding when you begin treatment so that they don't end up getting reinfected. Could there be any complications with baby ringworm? Your baby might have an urge to scratch their skin, which can lead to the development of a bacterial infection. This is why it's so important to keep a close eye on your baby and to keep their nails short. Should you notice that they're scratching their skin, you might want to consider putting little socks or mittens on their hands while they're asleep.